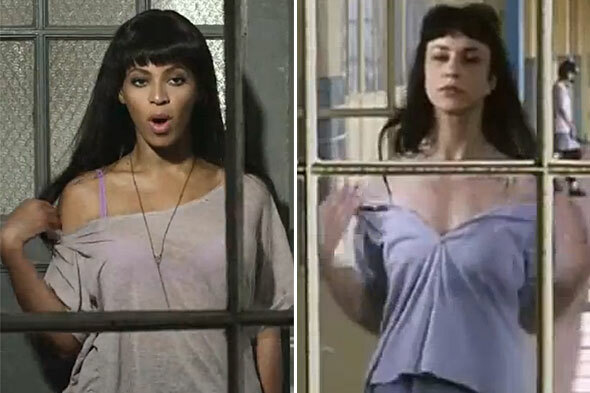 Anne Teresa De Keersmaeker, a well-known Belgian dancer-choreographer, has accused Beyoncé of stealing her moves. The dancer argues that the pop icon’s recently released “Countdown” music video, contains scenes bearing a striking resemblance to two of her Belgian works. One of the scenes in question depicts Beyoncé looking at the camera through a window on the left side of the screen with a split-screen effect and three background dancers on the right performing a dance routine that strongly resembles the one from De Keersmaeker’s 1983 film, Rosas Danst Rosas. In a second scene, Beyoncé performs a dance quite akin to the choreography in De Keersmaeker’s 1990 film, Achterland. In a public statement, De Keersmaeker assured readers that she was not angry, but emphasized the existence of “certain protocols and consequences” to such actions. Now, the films’ lawyers have apparently contacted Beyoncé and her Sony management team in order to address the alleged similarities. For her part, the pop star acknowledges the similarities between her video and De Keersmaeker’s work, but insists that it is just “one of many references” in the video. “It was one of the inspirations used to bring the feel and look of the song to life,” she explained in a public statement. There is no denying that the ‘Countdown’ video is “inspired.” It is filled with obvious references to 20th century film icons, from Audrey Hepburn to Doris Day to Twiggy. A video circulating the internet shows the similarities between Beyoncé’s video and the Belgian films. What more, this is not the first time Beyoncé has been accused of ripping off dance moves. So the question is whether – and to what extent – the singer can be held liable for the alleged plagiarism. The Copyright Act of 1976 does allow for the protection of “choreographic works,” affording the owner of the copyright the exclusive right to perform and display publicly the protected material. The U.S. Copyright Office broadly defines choreography as “the composition and arrangement of dance movements and patterns usually intended to be accompanied by music.” To be eligible for protection, the works must be “fixed in any tangible medium of expression . . . for which they can be perceived, reproduced, or otherwise communicated . . . .” With modern-day technology, it is relatively easy for choreographers to “fix” their works in videos. On appeal, the Second Circuit found that the trial court applied the wrong standard. According to the court, the test should not be whether the photographs could recreate the choreography, because when the two materials are in different mediums, finding such recreation is “unlikely if not impossible.” The court acknowledged that “social dance steps and simple routines” are not considered choreography for the purposes of copyright protection. Instead, the Second Circuit defined choreography as “the composition and arrangement of dance movements and patterns . . . intended to be accompanied by music.” Allegedly plagiarized choreography, the court held, is subject to the substantial similarity test; in other words, the court must determine “whether the ordinary observer, unless he set out to detect the disparities, would be disposed to overlook them, and regard their aesthetic appeal as the same.” The Second Circuit remanded the case to the trial court to apply the proper test. The dispute was subsequently settled out of court, but the Second Circuit’s precedent remains the standard by which a potential choreographic copyright infringement suit would be decided today. Still, there remains a large grey area. The courts have yet to find a violation of copyrighted choreography, leaving lawyers and choreographers with limited means of predicting the outcome of a potential suit. Beyoncé may employ such defenses as the fair use doctrine and transformative use, arguing that the video incorporates a number of popular culture references. However, given the similarity between Beyonce’s choreography and the original dance moves in De Keersmaeker’s performance, as well as the comparable costumes and cinematography, it seems likely that the Belgian film company may have a solid case. In any case, we’ll have to wait for Beyoncé’s next steps . . .